Everyone who designs, builds or services electrical equipment is familiar with a crimp style connector. It is a basic component that is used to either connect or terminate wires. But, as often is the case in engineering, the items that seem simple oftentimes are not, and components that engineers, designers or electricians view as requiring no thought oftentimes cause trouble. This trouble can appear in the design phase, regulatory phase, production phase or during the product life. With careful planning and some basic knowledge of how this component is intended to be used, a product will see a good and reliable connection throughout the product life cycle. The basic premise behind a crimp is a combination of electrical and mechanical engineering and the intended outcome is a low resistance electrical connection. The crimp may join multiple wires together or be used to terminate a single conductor on a component. 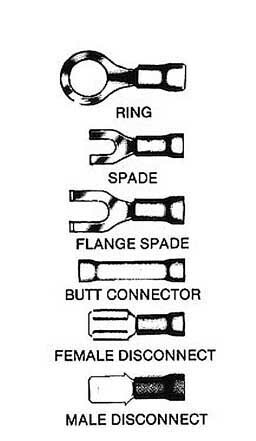 In the termination types of crimps there are several “tongues” that are available (see figure 1 for some examples). The focus of this article is not on the tongues; although, their proper use is important and requires correct sizing and application within an end product. The suitability of a crimp lies within the crimp itself. The crimp is, on the surface, simple. A metal barrel is compressed around a wire (or wires) with enough force to create a voidless single piece of metal (cold weld). This would create a very low electrical resistance between the crimp barrel and the wire(s) being crimped. From the design standpoint the resistance is assumed to be low (on the order of micro ohms). Where is the complexity in this? In practice, the crimp is not a “standard” component like a switch, contactor, relay or another stand-alone component would be. It goes without saying that the crimp connector needs to be applied based on its certified electrical and temperature ratings, but the crimp is a product of a crimping system. This system needs to be considered whenever a crimp is manufactured (at a factory, during a field repair, during design). How is this a system? It looks like a component. The crimp connector has a specific installation instruction sheet that is provided with the purchased crimp connector. These instructions tell the user all of the necessary information to provide a reliable electrical connection. The components of the system include: (1) the crimp, (2) the correct wire size (or combinations of wires), (3) the correct dressing of the wire(s) for crimping (twisting before crimp, strip length, etc.) and (4) the proper tool/die required to make the crimp. If any one of the system parameters is omitted or modified, there is a potential for a bad connection. How common are bad crimps anyway? A recent Consumer Product Safety Commission (CPSC) investigation on Fixed Position Electric Heaters (S-00-5262) had an annex that evaluated this in ten off-the-shelf samples of fixed position heaters that were manufactured by three different manufacturers. In that study, there were a total of seventy-one current-carrying crimp terminals. Of the seventy-one connections, a significant number (>10%) had various manufacturing errors that were classified bad crimping connections. These were all factory controllable errors, as described in the report. The full details of this investigation are outside the scope of this article and the full investigation can be obtained and downloaded fromwww.cpsc.gov. The intent in citing the investigation is to provide an example showing that crimps are not as simple as they may appear and that these errors are preventable in the crimping process. Also, it is important to remember that these connectors are widespread and popular due to their ease of assembly and low cost. There are several examples of errors that could occur in the crimping process. The end result of a bad crimp could be a fire or shock hazard being introduced into an end product application and use. When engineering a product, the engineer/designer needs to consider the initial crimp and the connector over the life of the application. In an initial crimp, the engineer must have the manufacturer follow the installation sheet requirements (all parts of the crimping system); but a good crimp out of the factory could see high contact resistance over time if the designer does not consider effects of the environment such as thermal shock, vibration, movement, pollution (dust, dirt, corrosion), just to name a few. What are some factory stages of the crimp process that, if monitored and controlled, could provide a predictable and low resistance connection? 1) Loose Strands (noted in CPSC investigation). Twisting multiple wires together or just twisting the individual conductor strands will help balance the load on the wire(s) being connected. The more strands that are not captured and cold-welded in the barrel during the crimping process means the fewer strands that are present to carry current in the application. This could effectively reduce the conductor size in the barrel and lead to a localized resistive heating effect. This heating could melt the plastics that are in contact with the hot connection and could lead to a fire within the product. Also, loose strands could cause increases in creepage and clearance distances. This could lead to product malfunction or increased risk of shock hazards. 2) Misaligned Crimp (noted in CPSC investigation). This occurs when the barrel is crimped off-center by the crimping tool/die. This crimp manufacturing error could cause a crimp to have low resistance in some situations and high resistance in others. This will depend on how much of the current-carrying wire is captured in the cold weld. Similar to a loose strand, the off-center crimp may only capture a percentage of the current-carrying conductor strands. Some of the strands will be loose within the connector (and may not be noticeable by a pull test), while others are carrying the full current. The result is an unbalanced load on the strands, a high connector resistance in the barrel weld and a reduced conductor current-carrying capacity. If this unbalance is severe enough, it could lead to localized heating and melting of plastic materials or other adjacent combustible materials. 3) Worn Crimp Tool or Wrong Tool. All tools wear; crimp tools are no exception, and using a worn tool could be the same as using the wrong tool to perform the crimp. A worn crimp tool will not properly cold-weld the wire and barrel. The result is a loose connection which, in the right condition, would lead to a high resistance connection at the termination. This connection would heat and damage the terminals and potentially combustible materials in contact with the connection. Sometimes improper use of simple components causes the most problems later on, unless the proper attention is paid to them. Crimps are an excellent example of this. They are commonly used in a wide variety of applications; crimps and crimp tools are readily available in hardware stores, and “do-it- yourselfers” sometimes do not read the instructions. So from manufacturing, to installation, to field repair there is a large opportunity for crimps to be made incorrectly. By taking a little more time and familiarizing yourself with the requirements for the crimp (via the installation instructions), you could be preventing a serious equipment fault (or failure) from occurring. Andrew (Drew) DeIonno is a Senior Project Engineer for MET Laboratories in Raleigh, North Carolina. As an electrical engineer, he has 10 years experience in product safety evaluation and certifications with two different NRTLs (ITS and MET Laboratories). He is currently active in IAEI and NFPA 79 standards writing committee as an interested party.